A business management system with configurable workflow management allows a company to build in the processes and activities that set it apart from the competition. Hello and welcome to the latest webinar from Essent. Today we’re going to show you a how a Business Management System with configurable workflow lets you build-in what makes you a success. In a competitive marketplace, workflow can set a company apart. What you do and how well and consistently you do it creates the value of the business. You want to build that into your business management system and we’re going to show you some ways to do that. My name is Doug Brill. I’m the Essent marketing coordinator and I specialize in the promotional products industry. I’m also your moderator today. We expect you may have some questions, but in an effort to keep the webinar concise for everyone we can only answer them off line. Feel free to use the webinar control panel to submit questions, and we’ll be happy to answer them for you after the webinar has ended. Slide 5: What is Workflow? When we talk about workflow, we’re referring to the processes and activities performed on a day-to-day basis. We’re talking about the processes and activities that bring transactions from start to end. We’re talking about the unique way that an individual company does business. When it comes to creating the value of a business, a lot of people might first point to the products and services they sell. But in most marketplaces, competitors are going to have similar items at similar prices. Now how is a company going to set itself apart? Slide 7: Workflow helps create the value of a business. One way for a company to set itself apart is simply what it does, how well it does it, and how consistently it does it. In other words, workflow helps create the value of the business. Ideally a company wants to make workflow a part of its business management system. But there are barriers to doing so. Most companies are using standard software – that’s what makes the software standard, after all. But that forces a company to be standard as well. The software isn’t designed for the way you do business. And you may even have to conform the way you do business to the software. Custom software can be tailored to your workflow, but it comes with added costs. Beyond the custom development, costs for ongoing security, support, and maintenance add up quickly. The solution is configurable software. It’s tailored to the way you do business, without the steep costs of custom software. With configurable workflow, companies define their processes and activities for each step of the transaction – from product research all the way out to accounting and beyond. Then the company would configure the business management system to carry out that workflow. The system will then alert the appropriate staff when it’s time to perform those processes and activities for each order. Slide 10: Tell your software what needs to get done, and then it tells you. In effect, you tell the software what needs to get done and then it tells you. And with that, here to bring you a closer look is your presenter, David Jungling. DJ is a sales executive for Essent. And he’s also a specialist in the promotional products industry. He’s going to tell you more about how configurable workflow lets you build in the workflow that makes you successful. Thank you, Doug. I thought it would be a good idea to start off by elaborating a bit on how workflow works. Even for the most complex transactions, workflow is a pretty simple equation: A certain scenario happens, and the corresponding activities are performed. Every company does it differently. But each transaction represents dozens of activities and processes that take it from start to finish. Configurable workflow means that the company defines the way it does business. Then the company configures the software system to have staff carry out business that way. So here are some typical ways that a company can have the system initiate workflow. One is by product configuration. Another is by order status. Timelines can also trigger workflow. As can exceptions. So let’s take a look at how workflow works by product configuration. Rarely are two transactions the same. In some industries, like the promotional products industry, every order is customized. So product configuration becomes a crucial yet also often complex exercise. In the Essent Business Management System, product configuration presents itself as a simple series of survey questions. And answering the questions can initiate workflows. Let’s say that one of the survey answers indicates that the product configuration includes new artwork. That’s going to kick off the workflows associated with new artwork. So now the system alerts staff that this transaction is going to require a workflow for the tape creation. And it does the same for proofing workflow. Slide 18: Building the order builds the workflow. So just by configuring the product, the system generates the work associated with the details. In other words, building the order builds the workflow that goes with it. The type of order and where it stands in the order lifecycle can also serve as the trigger for workflow. Orders need certain action at certain points in the transaction lifecycle. What you need to do when the order is submitted is obviously different than what you need to do once it’s delivered. In a business management system with configurable workflow, you can define the processes and activities that need to be performed based on where the order stands. When the order is first submitted, for example, the system can initiate production scheduling workflow. When the order is a Work in Progress, the system can trigger another activity such as delivering a status update to the customer. Upon order completion, the system can trigger a review of the order and invoice before they’re sent to the customer. And when the order is closed, it can trigger workflow for follow ups with the customer. Slide 22: Know the workflow each step of the way. A company can configure the system to initiate the company’s own workflows for each part of the order lifecycle. The system knows the workflow for each step of the way. Workflow isn’t just a matter of what needs to get done. It’s a matter of when it needs to get done. So you want to be able to build in what needs to get done and in what timeframe. In the Essent business management system, you can configure workflow to set up processes and activities for a certain number of days out. Slide 26: Know what needs to be done and when. Again, the workflow is configurable by the company. So the activities and when they need to happen can be set up specifically for you. But the bottom line is the system will know what needs to be done and when, and so all of your sales reps will know what needs to be done and when. We’ve talked about configuring workflow by product configuration, by order, and by timeline. Now let’s take a look at Management by Exception. Managers don’t need to know every detail of every order, especially routine orders. Management by Exception refers to a practice where only matters outside of routine operations are brought to the attention of management. And a business management system can be configured to initiate workflows when exceptions are met. Let’s take a look at some exceptions that could initiate workflow. If an order falls below the minimum margin, that could be a situation that calls for extra scrutiny. So the system can kick off a workflow for an approval process from a manager when this exception is met. Maybe an order comes in larger than the company routinely handles. That could be more units than the routine order or more cost than the routine order or both. It’s going to be an extra important order, so there could be workflow for additional reviews. Most orders aren’t cancelled, so that might be another exception that calls for a closer look. The business management system can kick off a workflow to reach out to the would-be customer and find out what happened. Slide 30: Configurable workflow makes it easier to Manage by Exception. By definition, most orders are routine. When exceptions occur, however, a business management system with configurable workflow can notify management and initiate the extra tasks required for the exception. Configurable workflow makes it easier to manage by exception. Most companies know the way they want to do business. They know the workflow they want, the activities and processes they want to carry out through the order lifecycle. But what’s the advantage of building that into your business management software? Let’s list the benefits first and then we can discuss them in more detail. The first major benefit of configurable workflow is that workflow is now standardized and centralized. In addition to that, training time will be greatly reduced. Mistakes are going to go down significantly. You get a system tailor-made to your business without the need for custom development. And you’re going to get what we called Well-Formed orders, which are complete, accurate and ready for efficient processing right away. We’ll start off with standardized workflow because that sets the basis for some of the other benefits. With workflow built into the business management system, the workflow no longer exists in a cumbersome sales manual, in a far-flung notebook, or just in someone’s head. Companies with workflow built into their business management system now have one central repository for the way the company does business. So maybe you have a veteran representative who never forgets to follow up after the sample. But now with built-in workflow, now the system helps ensure that happens every time. The company defines what needs to be done, and the system automatically initiates workflows and alerts the staff members who need to carry it out. Standardized workflow forms the basis for the second benefit, which is a reduction in training time. Since the workflow knowledge is built in, now everyone has access to the same knowledge as the most seasoned representatives. New representatives don’t need to memorize each activity and process for an optimal transaction. The company simply configures the optimal workflow in the system, and the system helps ensure the workflow is carried out. In addition to reducing training time, configurable workflow also greatly reduces errors. There’s no more forgetting a step. That’s because the system is going to remind staff to perform the steps. The system can also be configured to make sure an order doesn’t move forward without the required workflow. For example, a distributor wants to make sure the artwork is right before it submits a purchase order to the supplier. The system can put the order on hold until it’s confirmed that the artwork was approved. The system helps ensure that everything that needs to be done for an order is done before it moves forward. One of the biggest advantages of configurable workflow is that a company gets a business management system tailored to the way it does business. But getting that tailored system doesn’t come with the hardships of custom development. Custom development is great for getting software that works the way you work. But what comes next? The company is on its own to handle support, maintenance, and security for its one-of-a-kind system. Those costs quickly surpass the cost of the software itself. Configurable software is the best of both worlds: functionality tailored for the way you do business, with support, maintenance, and security handled by an experienced technology solutions provider. And finally, configurable workflow is going to help a company build what we call Well-Formed orders. Well-formed orders are complete and accurate. They start right and stay right. And that sets them up for the most efficient processing possible. Since the company configures the system for what needs to be done throughout the order lifecycle, the system knows what’s needed for each transaction. So orders are less likely to move forward with missing or inaccurate information. An artwork approval workflow means the order is less likely to have faulty artwork, for example. If the purchase order goes to the supplier with mistakes, that’s going to cause problems and delays for both the supplier and the distributor. But the configurable workflow helps make sure orders have everything they need. We’ve looked at how workflow works. We’ve already looked at the advantages of configurable workflow. Now I’d like to briefly discuss Workflow Management specifically within Essent offerings. With the Essent Business Management System, workflow management is going to be built right in. The Essent Business Management System is an Enterprise Grade system that handles every step of the transaction lifecycle from quoting all the way out to accounting. And that’s one of the major differentiators for Essent workflow management: It’s part of a comprehensive system that’s used to run the rest of the business. You’ll see a lot of stand-alone software for workflow management. But if workflow isn’t ingrained in the system that carries the rest of the flow of business, what’s the use? Take something like a tape-creation, for example. With integrated workflow, the tape creation information now can flow into the quote to the sales order to the invoice to accounting. With a standalone software, it’s outside the system and easy to miss. Essent has a cloud-based business management system. That means the workflow is going to be available anywhere on any device -- whether that’s desktop, laptop, smart phone or tablet. So let’s say a workflow is triggered for artwork approval. Now that approval can happen from anywhere, whether the person approving is at the office, at home, at the tradeshow, or even at a client’s office. Workflow is visible and actionable anywhere at any time. We’ve just said that workflow is part of the overall business management system and that it’s available everywhere. And those combined lead to another advantage of workflow in the Essent Business Management System: Notifications. When workflow exists outside the business management system, it’s easy to ignore or bypass the workflow. It gets left behind. If people aren’t manually checking the workflow piece, it can become quickly forgotten. The Essent Business Management System on the other hand will send notifications to those who need to carry out the work. Some stand-alone workflow software will also do that, but there’s nothing that ensures the workflow is completed. And that’s where alerts come in. If the workflow isn’t completed, the business management system will know. It will flag the transaction to recommend it doesn’t move forward until the workflow is completed. So workflow in the Essent Business Management System is going to be part of the overall BMS. It’s going to be available anywhere at any time on any device. And notifications and alerts are going to help make sure that workflow gets carried out every time for the most efficient transaction lifecycle possible. And with that, I’ll turn it back over to Doug who will tell you how you can learn more. Thank you very much, DJ. Essent is dedicated to providing efficiency in the promotional products industry, and our solutions support all of the capabilities discussed today. Essent has configurable workflow within the Essent Business Management System. Companies identify the processes and activities that make them successful. Then they build that workflow into the business management system for more efficiency. To learn more about workflow management, you can visit Essent.com/WorkflowManagement There you can review everything we discussed today. And you can also use that page to get in touch with an Essent representative for a free consultation. Again, that’s Essent.com/WorkflowManagement to learn more. Thanks again to everyone for attending today’s webinar. Go with the Flow for a more efficient workflow and a more efficient business. 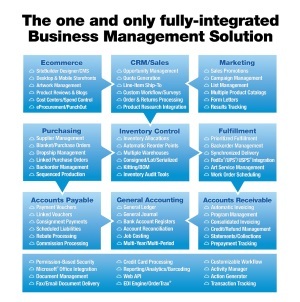 The one and only fully integrated business management system designed for the unique needs of the promotional products industry. Essent Webinars are informative, inspiring, and to the point. These fast, free webinars help you explore technology solutions for the promotional products industry.